Easy knitting tutorials for beginners. This sweet little scarflette is perfect for those colder spring nights when a full scarf is just too much. It works up quickly and is so easy to make. 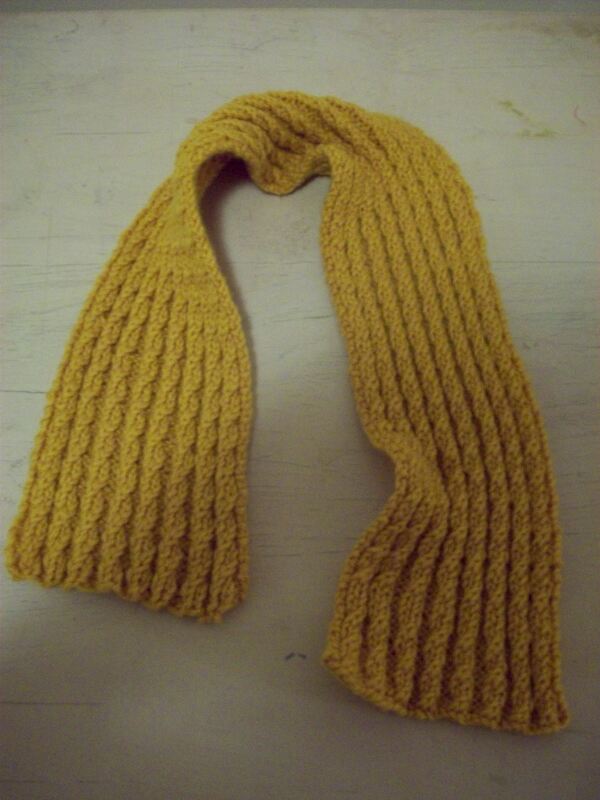 This scarflette is made using a baby cable stitch, but you can simply knit each row if you’re new to knitting. If you want to give the cable stitch a try (it’s really quite easy! ), this is a great project to practice with. You won’t need a cable needle, but you will need knitting needles that allow for knitting two stitches together (I recommend a bigger size, like 10 or 11 US sized needles). And there you have a fun and cozy scarflette! As I’ve said, you can use a basic knit stitch if you find the cable too difficult. These fun little accessories also make great gifts for Mother’s Day! Part of my 2012 pledge to myself is to cleanse…to rid myself of useless “stuff” that’s just taking up space in my new little apartment (pictures coming soon!). First up is to work my way through my yarn stash. I’ve taken up and given up on knitting since high school…but I really want to get back into it now. I’m learning new stitches and experimenting with cool patterns…and my latest discovery: how to knit an infinity scarf! This pattern is easy to follow and best of all, FREE! Knit scarf patterns are totally adoptable, so feel free to experiment with length, color, width, etc. These directions create a super comfy two-color infinity scarf. It’s made using Ridged Ribbon Eyelet stitch, but you can do the good ol’ K2, P2 if you’d like. I will say, though, that Eyelet stitch is so easy and fun, once you get the hang of it! Row 5: *Knit 2 together, yarn over*. Repeat from * * to last stitch. Knit last stitch. Repeat row 1-6 42 more times. If you’d like, switch to another color and repeat rows 1-6 15 more times…or you can just continue with the first color for 15 more rows. To make the scarf continual, you’ll need to sew the two ends together. I used the teal yarn and a tapestry needle for this step. Join the two sides together so the wrong side is facing out. Then simply weave the yarn through the first stitch on the white row and the first stitch on the teal row. Continue working your way down the row until the scarf is knitted together. Weave in ends. And there you have it! 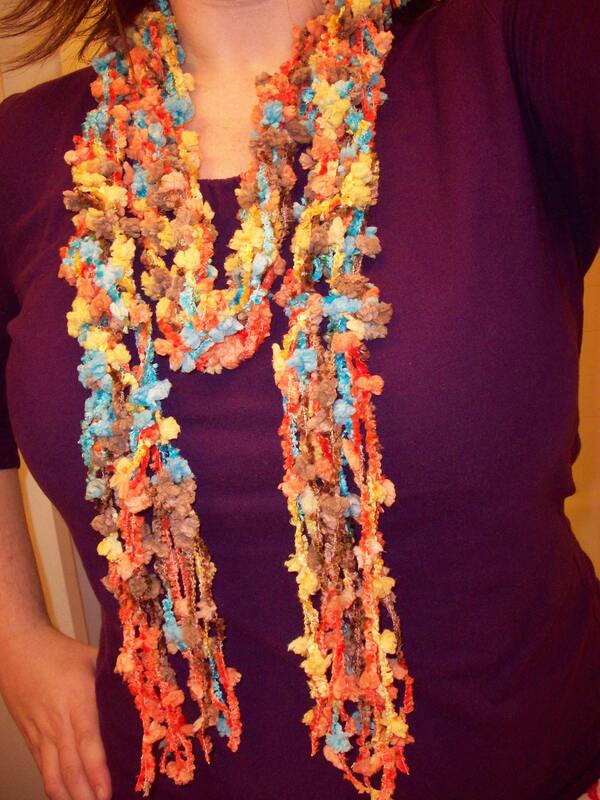 Warm infinity scarves like this can be worn indoors and out…I wear mine almost all the time! I’m going to try crocheting a flower in the coming weeks to add to it. I’ve never crocheted before, so any helpful advice would be appreciated! 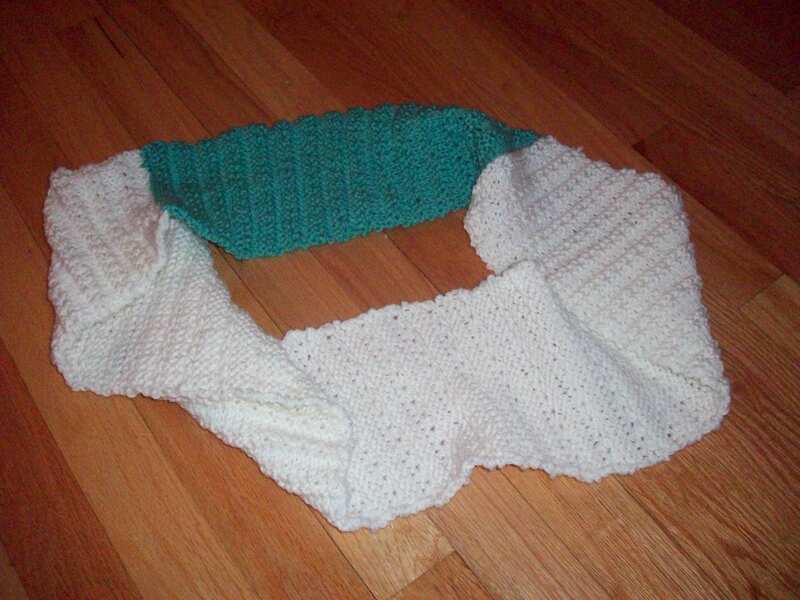 If you use this infinity scarf pattern, feel free to post your new scarf on the Hob-bee Hive Facebook page! I’d love to see how yours turned out! Not one to knit? No worries. 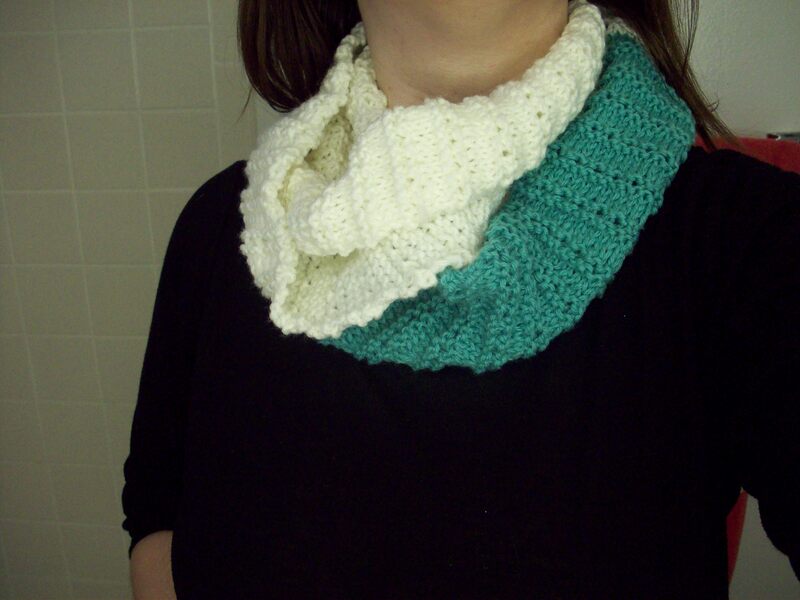 You can still make a beautiful scarf for yourself or as gifts for the upcoming holidays. 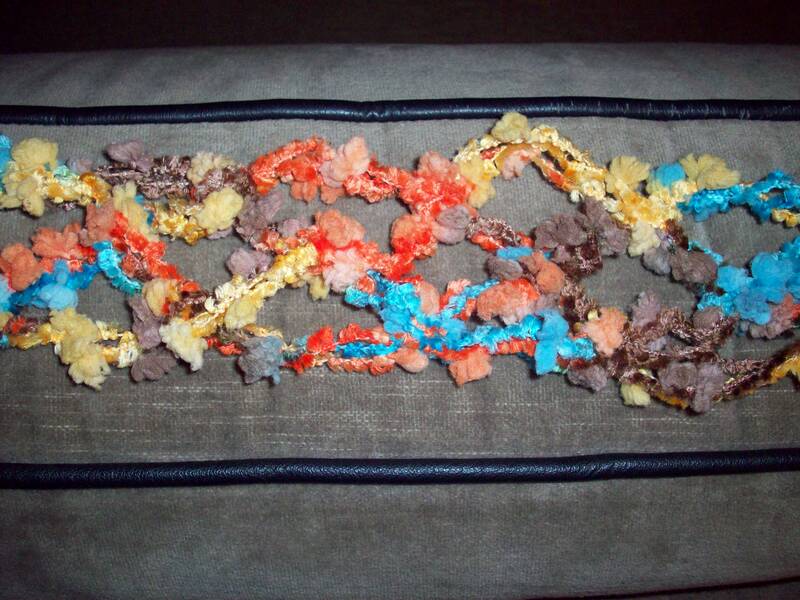 All you need is some think funky yarn and a little bit of patience. My No-Knit Scarf only took about 1 hour to make! 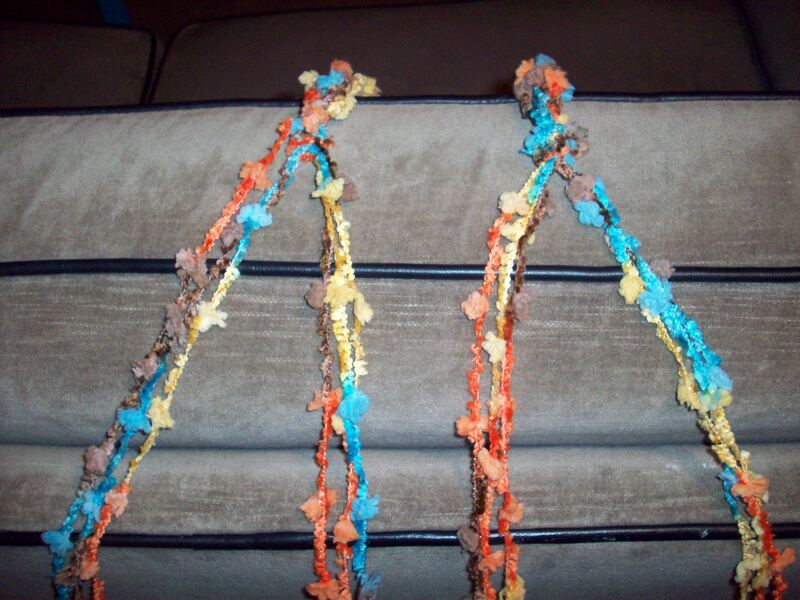 Cut 12 pieces of bulky-weight yarn, each measuring 140 inches long. 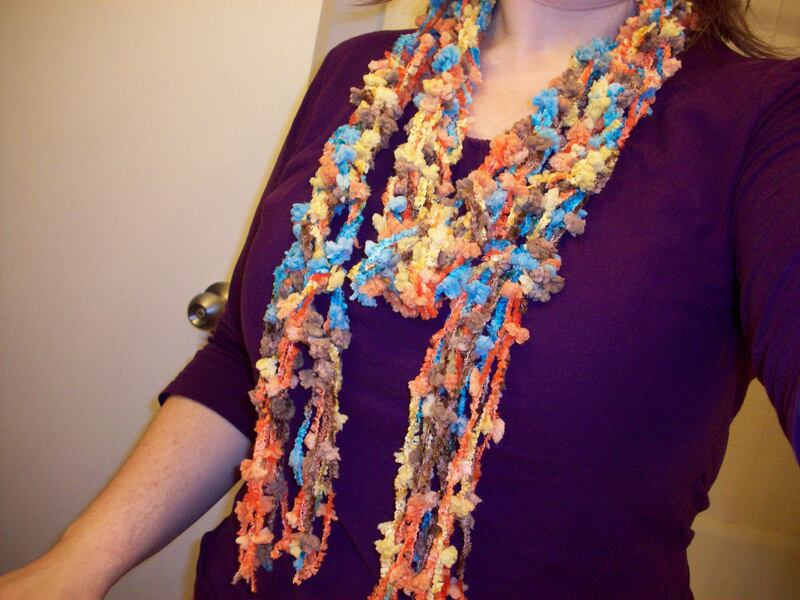 This will give you an 86″ scarf, approximately. Divide yarn into 4 bunches of 3 strands each. Tie 2 bunches together with a square knot, leaving 6 inches of fringe at end; repeat with remaining bunches. Pin the knots to a piece of foam board. Knot inner 2 bunches of yarn together, spacing knot about 1 inch from existing knots, then knot left and right bunches together. My 2 sets of yarn. Begin by tying the two middle bunches together. See, it kind of looks like you knitted it! Well, yours will…mine’s kind of messy. on the end. Finish so that final knots mirror opposite end, and trim to even the ends. Really thick, chunky yarn works best for this project.